In case you've missed/forgotten part one, here it is. Jimmy's mom finished tying the rope in a double knot around his ankle. "Are you sure you want to do this, Jimmy?" "No doubt in my mind, mom. No doubt in my mind." Jimmy was having a bad day. Earlier in the day his neighbour had hooked him with a fishing rod and tossed him out of the mysterious Couchland world; the place where his Dad had been sneaking off to relax while he was stuck at home with the chores. Jimmy still had the taste of the stale cheese-o in his mouth. His mom had tied to rope around his ankle and he was ready to dive back in to Couchland. The only thing he needed now was for the door to open. He had tried every button on the remote control, but the door to Couchland would not open. He sat there on the couch, shifting and turning to try to squeeze himself down into the couch. No matter what he did, he could not get through to Couchland. Frustrated, he fell down on the floor and threw the remote on the couch next to his mom. She turned the channel to her favourite show, Kitchen Killers. It's a show where a bunch of chefs cook meals really fast, then they all setup explosives and blow the place to smithereens. It was pretty cool, but now it was on a commercial about sports. A man in a shirt and tie spoke into the camera. If you're not sporting this weekend then you better have a good excuse because sportsy sports sports sports..."
The commercial was distracting Jimmy. He needed to think of a way to get the couch to open. He needed a way to get that remote to work. "Sports, sports, sports... This weekend... Turn it to sports, orts, orts…"
The commercial was ending and still Jimmy couldn't think of what he needed to do to get the remote to work." "I'm Roddy Hotrod, and this weekend if nothing else works... turn it to sports!" "That's it!" Jimmy jumped up and turned the channel to golf. He pressed the button on the remote and the couch started up like a vacuum. He looked at his mom and she gave him a big hug. "You go get that dad of yours and I'll make a mess of things here to give him lots of work to do when he gets back." She held firmly onto one end of the rope and with the other end tied to his ankle, he dove towards the couch. Just when he thought he'd hit his head again, the cushion gave way, like sinking into a big bowl of oatmeal. He slowly seeped into darkness. Then, the feeling started to smooth out as the slide began to form below him. Down, down, he went. He could see the trees, the forests, and the lazy, lazy dads of the world. At last he fell off at the bottom onto the cushy cushions. He got up to see a crowd had gathered around him. Dads everywhere! They stood there, smiling at Jimmy, holding their fishing rods and their beers. Jimmy's dad poked his head out from the crowd. He had sweat on his forehead and looked a little unsure of himself. “Heh, um... Hi, buddy! Thought I told you to wait for me back at home." "I'm here to bring you back, Dad. You know that this is not where you're supposed to be." A large murmur rose from the crowd. Dad's everywhere spoke up. "Yo, kid. What do you know, huh?" "Yeah, mind your bees wax, pal." Jimmy's dad chimed in. "Hey fellas, don't talk to my boy that way." Jimmy could see the conflict spinning its wheels inside his father's mind. It was clear that he didn't want people to disrespect his kid, but on the other hand, he was having a good time fly fishing and he didn't want Jimmy to spoil it. "Jimmy, come here." His father walked over and threw his arm around Jimmy, motioning for all of the other dads to scatter. Soon enough, they were alone. "Now Jimmy, you need to understand something. Couchland is bigger than you and me. 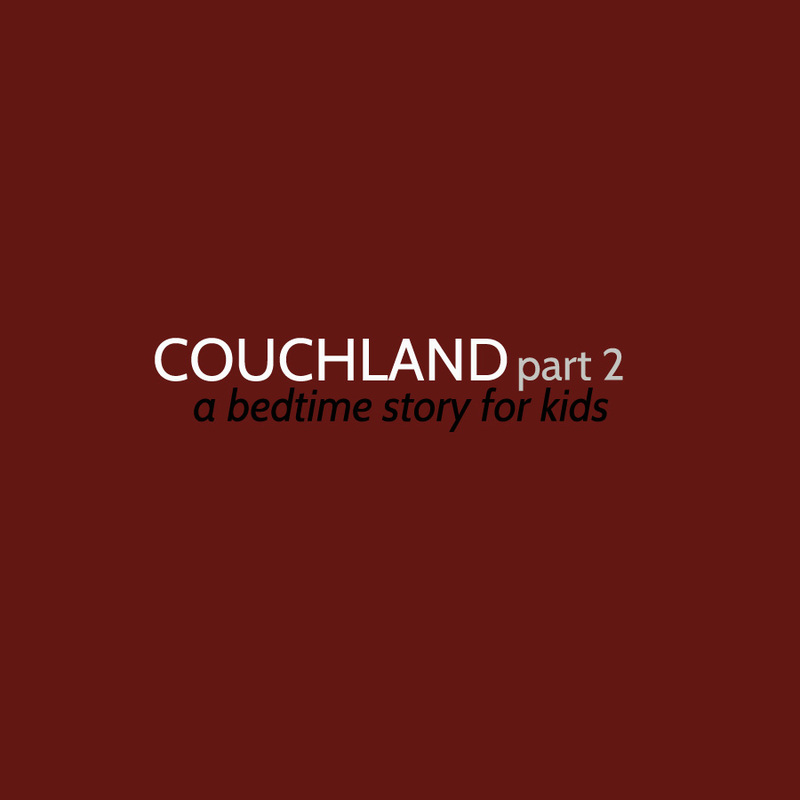 Couchland has been around for a thousand years. Powerful people have worked hard to keep this place a secret and I'm sure that they wouldn't want you to be sniffing around causing... um, problems for them." Just then, they heard a sound coming from the distance, beyond the trees and ponds. A great wind rose from the distant mountains, bending around the trees and over the waters. There appeared, hovering overheard, 3 giant hammocks. They just floated in the air, not attached to a tree or anything else. They slowly drifted down in front of Jimmy and his Dad. Each hammock carried a man, laying back, sipping on a drink, with his legs crossed. Down they came, landing on what seemed to be an invisible fluffy surface just 2 feet above the ground. Each man, in his own way, rolled off of the hammocks and stood upright before Jimmy and his nervous looking father. "Greetings, young one. It has been many year since we have seen someone of your age here in the wonderful Land of Couch." The middle one, a rather slim and tall looking chap, spoke. He wore flip-flops, old, comfy looking jeans, and a t-shirt that read 'world's best dad'. "We understand that you are unhappy with how we do things around here. We would like to offer you a complete tour of our world." Jimmy couldn't figure out how they knew he was in Couchland, or that he was upset. It was as if they had been spying on him somehow. Things were getting very strange, and Jimmy realized that this extraction was going to be a lot more difficult than he originally thought. "What da' ya say, Kid?" A chubbier version of the first man now spoke. He sported shaggy hair, pink sunglasses and a muscle shirt with the words "Sometimes Dad's Just Gotta Kick Back". The third man was wearing a suit, a black suit with a dark navy tie. He was quiet and didn't say anything, though Jimmy was smart and could tell that just because the man wasn't saying anything doesn't mean he wasn't paying attention. He seemed to be doing a lot of observing. There seemed to be a clear expression of concern written on his face. "Um, yeah. Okay, I would love to see this place. The whole place, right?" at once 2 more hammocks arrived out of the sky, ready to take Jimmy and his dad along with the 3 men. Off they went. Jimmy enjoyed the fresh, clean air of Couchland, though at times he could still detect the faint smell of his favourite spot on the couch. The sun was high in the sky, lighting the vast valleys and hills that seemed to stretch on forever. As they flew, Jimmy could see thousands and thousands of dads. Dads everywhere. Dads grilling burgers, dads playing video games, dads drinking beer, and dads doing... yoga? "Well, okay." thought Jimmy. had long fairways and smooth greens. Yet, upon closer inspection, each fairway seemed to be tilted and slanted in a way. Not unlike a great, big funnel. Sure enough, Jimmy watched as a man teed off. The ball sailed wide of the fairway and landed well off course. Yet, wait a minute! What was this?! The ball started rolling. Rolling back toward the fairway, down the fairway. It rolled for over 200 yards! It rolled right up on to the green. It took a left turn and rolled straight for the hole. Down it went! Hole in one! The man and his friends high fived and chest bumped each other as if they were celebrating a great athletic achievement. "Those turkeys!" shouted Jimmy. "They're even cheating at having fun?! What sort of place is this?" "This is a place of rest and relaxation," shouted the thin dad. "These Fathers need their "me" time. They need a place where the cards aren't stacked against them. A place where their ball can get a lucky bounce now and then. That's all." "Oh, phooey! You guys know good and well that this place is a big waste of time. That there are people, mothers and kids, waiting on the other side for these dads to 'man up' and take care of their responsibilities." Suddenly, all of the hammocks came to an abrupt stop. The 3 men circled their hammocks and conversed with each other. Jimmy's dad looked worried. Jimmy was mad and he didn't care what these men were discussing. He didn't care one bit if they decided to shoot his hammock straight through the sky and back up into his living room. He wanted nothing to do with this lazy place and these lazy people. "Come on, Dad. These people are hacks! They should not be here. This place should not be here. It's a nightmare." His dad seemed speechless. He just sat there in his hammock, with a look that seemed to anticipate some pretty serious ramifications for screwing up and letting Jimmy get in to Couchland. "Listen, Jimmy." His dad whispered. "These guys are serious business. I know I shouldn't be here this much, but they force me to." Jimmy glared at him, not believing one word. "Okay, maybe they don't force me but... they, um, they have this power over me. I don't know what it is. I know I should do my chores, but when they come around I always find myself with the remote in my hand. I... I..." He broke down. "I'm so weak, Jimmy. You gotta help me! Get me outta here, Jimmy!" Jimmy felt pity for his dad. His sad, little dad. And just as he was conjuring up an escape plan, the 3 men floated over. "Jimmy." It was the man in the suit who spoke this time. "We understand your frustration. We want to let you know that we've decided that we'd like you to take part in Couchland as well." Jimmy didn't know what to say. "We know that you work hard, too. And we've decided to let you in on a little secret. The man held up a shiny, black remote control and pressed its big red button. All at once, the hills and mountains dropped out of the sky, like a big curtain being dropped from a magic trick. Jimmy couldn't believe what he saw. It was a whole other world! A world full of people, but not dads this time. No, this world was filled with kids! Kids just like Jimmy! "Jimmy, may I present to you... Screenland!" They all floated over into this new world, leaving the dads and their silly golf behind. Now things were serious. In Screenland there were screens everywhere! For starters, each child had their very own tablet. In fact, each child had their very own go-cart that they used their tablets to control. Kids raced everywhere. Left and right, go-carts zoomed around the open space. Some kids raced each other, other kids seemed to have their go-carts on autopilot. Yes, it was true! He saw kids coasting around in their carts, yet playing a completely different game on their tablet. And at times, they'd pause their tablet games to check their... wait, was it true! Yes, they could check their very own cell phones! Jimmy could feel himself salivate. He couldn't believe all of the action. Hanging from the sky, seemingly by some sort of invisible ropes, hung huge flat screen TVs. Cartoons played high up in the sky as the kids raced around. Some kids got out of their go-carts and sat down on huge, massive carpets. They crooked their necks up at the screens and just stared at the shows. "This place is heaven!" Jimmy said out loud. He couldn't contain his excitement. He could feel the heat from all of the radiation that flowed out of all of the devices. Though the environment was full of birds and plants and a giant waterfall, all Jimmy could hear was the glorious hum of the electronic equipment. "Jimmy, what do you think?" The suited dad spoke up. "Isn't it amazing?" "Well, all of this could be yours. All you need to do for us is to keep quiet about Couchland. Tell your mom you fell through a crack in the couch, nothing more. No big deal. Jimmy was already busy memorizing those horrible lies when his dad grabbed him by the shoulders. "Jimmy, what's gotten in to you?! Have you gone berserk!" Jimmy couldn't hold back. At once, he bolted towards the ground. His hammock zipping away from the group. His father chased after him while the other men smiled as they looked on. "Perfect, we have Jimmy right where we want him." And they all laughed like silly hyenas. Meanwhile, Jimmy's hammock was close to the ground when his dad caught up to him and JUMPED OFF OF HIS HAMMOCK! He flew through the air, tackled Jimmy off of his ride, and they both tumbled to the ground. The smell of electronics filled the air as Jimmy and his Dad tussled in the grass. His dad tried to calm him down by pinning his arms, but at the last minute Jimmy reached for an out of date tablet laying on the grass and smacked his dad right in the shoulder. Schrump! His dad flew back and Jimmy tossed the useless device to the side in search of a new, more effective one. Suddenly, his dad was back on him, and this time with a little more gumption. Jimmy felt his dad lean into him and smear his face in the mud. Children all around were too fixated with their games and gadgets to even realize that this scuffle was going on right in front of them. Jimmy was down. His father pinned his arms into the mud and pressed him down further. "Jimmy, you gotta come to your senses. This place, these screens, they're going to ruin you!" "But what about you dad? What about Couchland?" Jimmy could tell his dad was thinking things over. He could see it in his eyes. All the relaxing, and the hammocks, and the golf. All of the 'taking it easy'. Was it worth it if it meant he was cheating his son out of quality time and his wife out of honest work? He released Jimmy and helped him up. They sat for a moment. "Listen, son. You're right. This place, and Couchland... these worlds are bad because they make us weak and dishonest men. We need to find a way to end it." They got up and looked around. The strange men were nowhere to be seen. They thought that was for the best as they didn't want to be bothered by them while they were trying to ruin their worlds. "Look, dad!" Jimmy pointed up a high mountain. Near the middle stood a giant HD TV. Probably the biggest TV he had ever seen in his life. "Jimmy, this is no time to watch TV." The both said it at once, "source of all the power!" At once they raced towards the mountain. On the way they heard a noise from above. The bad dad's were on the move! Their hammocks swooped down and one just missed nabbing Jimmy with a long HDMI cable. Jimmy saw a boy playing a GameBuddy while riding on a hover board. Jimmy pushed the boy off (and he didn't even notice he was so focused on his game) and Jimmy's Dad hopped on the back. They raced towards the mountain! A bad dad swooped down again and swung the HDMI cable. Jimmy snatched it out of his hands. Then he made a lasso and tossed its loop around the bumper of a scooter racing by. The boy on the scooter was racing to the big TV to see the end of his favourite show. Jimmy and his dad immediately sped up. The cable acted like a bungee cord and they shot like a slingshot towards the TV. In fact, they soared a bit too fast, flew into the air, and crashed right through the screen! "What are we gonna do without da' big screen?!" Jimmy and his dad got up and looked around. The cord lead up the mountain. Yet, from around the front of the TV, a gang of kids had gathered. "Hey, there they are." A boy pointed. "Get 'em"
Jimmy and his dad took off up the mountain. After about 10 seconds they turned around and saw that they were not being followed. The gang of kids, in fact, were all too lazy and out of shape to chase them. Someone in the group had found an old GameSlug and the rest of the gathered around to watch. Jimmy and his dad looked at each other, shrugged, then headed back up to the top of the mountain. At the top, they found what looked to be a giant brick of power. It was in the shape of a brick, it was huge, and it seemed to be radiating energy. They were about to step towards it when the Bad Dads showed up. "Well, well, well. Looks like you two got smart and found the source of power for not only Screenland, but Couchland as well. Too bad you're not going to get any closer to it." "What you men are doing is wrong!" shouted Jimmy's dad. "Wrong?! Wrong?! You want to know what wrong is? How about having to do the dishes after your wife makes cheesy, slimy, sticky macaroni surprise. Or how about having to mow the lawn with a mower from 1973? You know how hard it was to mow the lawn in 1973? It must have been hard because mowing the lawn now, in this year, with a lawnmower from 1973 is really, really hard!" "You're right." Jimmy's dad said. "You're right. It is hard. Being a man is hard. There is work to do. It needs to be done. If you're not going to do it, who else is going to do it? You're poor, poor wife? I'm sure she already works hard. You're kids? Well, I know how that works." He looked at his son. "I feel like nothing but a lazy, lazy little man. And I'm sure that, if you gentlemen look inside your hearts deep enough, you'll find a real, honest, hard working man in there." The Bad Dad's were quiet. Their shoulders were slumped. One of them was kicking the dirt in a sheepish way. Another actually said "Awe, shucks". With tears in his eyes, the middle one spoke. "You're absolutely right. No question about it." The men turned aside, making a way for Jimmy and his dad to unplug the worlds and end the madness. Jimmy's looked up to his dad, but his dad just pointed the way and encouraged Jimmy to do the honours. Jimmy took a step forward. He could still hear the sound of games everywhere. Beeps and Bops, car-racing games, fighting games, games where you pretend you're a kid pretending to play a game you're a kid pretending to play. That was Jimmy's favourite. He felt the lure. He felt the urge to run back and get lost in the mindless, soul-killing act of life gaming. He had heard about kids in Japan who had got into life gaming. It's where you never stop. You play and you play. Cause if you stop, you're body can't handle it. If you stop, you die. Jimmy gulped. He knew what he needed to do. He ran towards the power brick and reached for the cord. With an instinctual last second change of heart, all of the men (including Jimmy's dad) ran after him. "Nooooo!" they cried. But it was too late. A bright flash of light, and then it was quiet. The next moment Jimmy and his dad were back in their house, sitting on the couch, watching the basketball game. They both looked at each other and realized that it was all over. Was it a dream? Jimmy's mom was in the kitchen doing the dishes. At once, Jimmy and his dad bounced up, turned off the TV, and hurried over to the kitchen. "Here, let us finished up in here. You go relax for a bit." His mom was speechless. Jimmy just grabbed her by the arm and gently walked her over to the living room and sat her down on her favourite chair. She still didn't say anything. She just sat there. Jimmy and his dad scrubbed away at the pile of dishes. "Was that real?" Jimmy whispered. "I don't know," said his dad, handing him a plate to dry off, "but first thing in the morning I am cancelling my sports channels."